Confidence is key in an interview. Find everything you need to finish your perfect look! 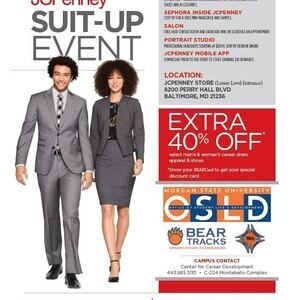 Find everything you need to finish your look for your next interview or a new job at an Extra 40% off. Offer includes Suits, Dresses, Sports Coats, Dress Pants, Shoes, Accessories and Briefcases. Be sure to bring your BEARcard for check-in.